How Can A Christian Have Peace That Transcends Understanding? How can a Christian have the kind of peace that transcends human understanding? Did you know that the unsaved who sin are piling up or storing up wrath against the day of God’s judgment? Paul writes that it’s “because of your hard and impenitent heart you are storing up wrath for yourself on the day of wrath when God’s righteous judgment will be revealed” (Rom 2:5) but it’s important to note that this is within a paragraph that is directed toward the unrepentant or the lost who refuse to acknowledge God (Rom 1). Paul is not addressing the church because “God has not destined us for wrath, but to obtain salvation through our Lord Jesus Christ” (1 Thess 5:9). We are at peace with God by Jesus’ shed blood and “Therefore, since we have been justified by faith, we have peace with God through our Lord Jesus Christ” (Rom 5:1). You have no access to the peace which transcends all understanding until you are at peace with God. You cannot have the peace of God until you are first at peace with God. Paul once wrote that “the peace of God, which surpasses all understanding, will guard your hearts and your minds in Christ Jesus” (Phil 4:7) and the word for “guard” is like that of a referee or umpire so and comes from the Greek word “phroureō” which also may mean “to protect by a military guard, either to prevent hostile invasion.” This peace is not our peace but “the peace of God” and is a result of Jesus’ death on the cross as it was “Jesus, who rescues us from the coming wrath” (1 Thess 1:10b). This is the only way to be at peace with God and to receive the peace of God. There is absolutely no other way to have the peace of God than through Jesus Christ (Acts 4:12). God is opposed to anyone that is filled with pride. This is exactly what James and Peter both wrote; “God opposes the proud, but gives grace to the humble” (1 Pet 5:5; James 4:6). The word “opposes” means “to range in battle with” or “be at war with” so if you are so proud that you will not repent of your sins and trust in Christ and bow the knee to Him, then God is at war with you and you know who wins. The idea of the peace of God is the last thing that is possible because they’re not at peace with God; for those who have never been saved, God is at war with them and is storing up His wrath against them and will be revealed on the Day of Judgment (Rev 20:12-15). Just before Jesus went to the cross to die and later, was to return to the Father, He knew that they were troubled in heart so He said “Peace I leave with you; my peace I give to you. Not as the world gives do I give to you. Let not your hearts be troubled, neither let them be afraid” (John 14:27). The difference between the peace the world gives you and the peace that Jesus gives you has everything to do with Who gave it! If Jesus gives you something, you can’t lose it. If the world gives you something, they might take it back again. 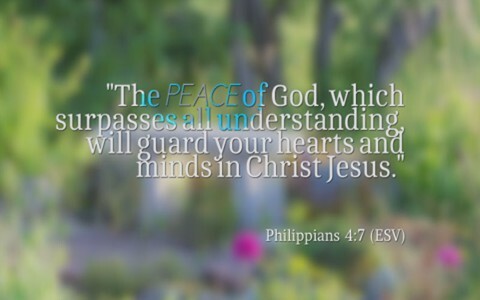 The peace Jesus leaves them is His peace and not just “peace of mind.” The permanent God-given peace can quiet the troubled heart and it can calm the fearful heart. The worldly type of peace cannot do this. If you do have any peace the world gives, then it’s only temporary and very fleeting. You can only have that peace which transcends or surpasses all understanding if you have repented and trusted in Christ. Up to that point, you have God’s wrath (John 3:36b) and condemnation (John 3:18) but after repentance and belief, which was Jesus’ message (Mark 1:15), you can have the very same peace that Jesus left with the disciples. Don’t try and figure it out; Paul says you can’t (Phil 4:7) but just believe it. I can’t explain how my car works with all the combustion, moving parts, and computer components but I don’t have to explain it; I’ve got the keys! You must believe and confess this belief with your mouth publically and then you can be saved (Rom 10:9-13). Whether you can fully understand it or not you must choose to believe it. I believe in the Trinity but it is hard to explain by human means. I know God is eternal but my finite mind cannot go back to “infinity and forever.” The infinite cannot explain or fully comprehend the infinite but the Infinite, knows everything there is to know about the finite. I don’t have to understand it all perfectly; I only have to believe it. If you had a time in your life where you turned away and forsook your sins (repented) and then placed your trust in Jesus Christ as your Savior, then you have the peace of God by means of making peace with God. That means it was only through Jesus Christ (Acts 16:30-31). It is not necessary to understand the peace of God to have it. I hope you do.